For Mother’s Day, my husband got me two very practical gifts (gifts I wanted!) 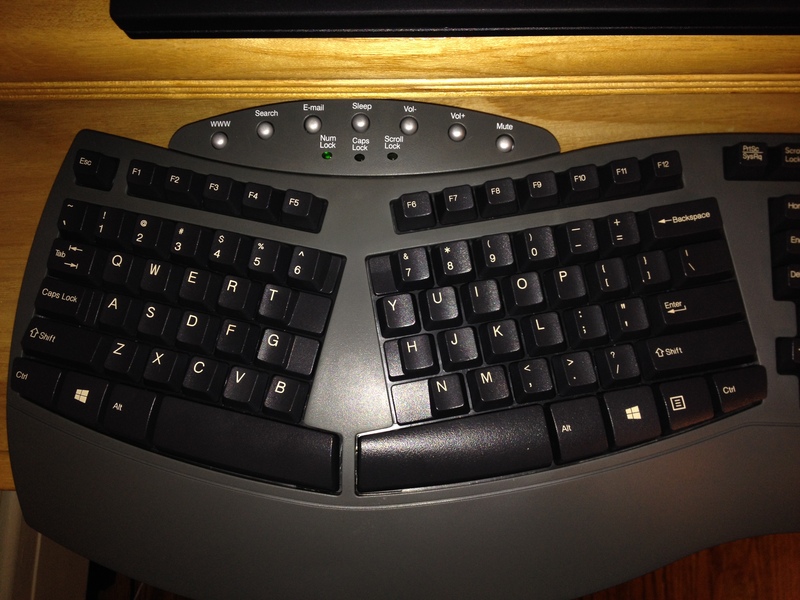 — an ergonomic keyboard and mouse. Unfortunately, after typing up my dissertation, and while writing Optimize for Victory (all in the past year), I developed carpal tunnel syndrome. It can be extremely painful and difficult to manage at times. The nerves are so sensitive in my right arm/hand that it hurts to touch anything with texture! This has been especially difficult to manage with also trying to handle my one-and-a-half year old. Therefore, my husband researched keyboards and decided to get me the one in the attached picture. It’s taking me some time to get used to it, particularly because I have been typing incorrectly, apparently, for 18 years! We did formally learn typing in our computer class back in elementary and middle school; however, I would say that I truly could not type quickly until my family got a home computer when I was 14. It arrived at the perfect time, especially since I started high school still typing my papers on a typewriter! Once we got the computer, we signed up with AOL. As I discovered the new world of AOL instant messaging, I had to learn how to type quickly, especially because I could not keep up with all of the instant message conversations with my friends! Now that I am using my brand new keyboard, my typing speed has significantly decreased, mainly because my left hand wants to cross over to the right side at times, especially to hit the “y” key. To be honest, I was shocked to discover I have been typing incorrectly for so long. I’m sure I will eventually get used to this keyboard, but it will be extra challenging because I essentially have to correct a “bad habit.” But I’m positive that correcting this habit will probably incrementally help me become a better and faster typist; I was probably inhibiting my typing speed and straining my hands without realizing it! As we talked about the other day in Why Everyone Should See the Lego Movie, sometimes it’s a good thing to have a “blank slate” — not to have any preconceived notions or bad habits. Often it’s harder to unlearn something that’s ingrained in you than to learn it the right way in the first place. Similar to the typing situation I am writing about here, I went through this when I restarted violin lessons as an adult; I had no idea I had been doing some things improperly while playing the violin as a child. Why is this important to you? Because many of you study personal development — you want to be successful and victorious. Sometimes you discover that certain habits or thought processes that are ingrained in you may be inhibiting you. This is certainly not a judgement, as I am constantly working on various thought processes that take away from my chances for success. One example is when I used to belabor being upset about a failed friendship or relationship (discussed in my book Optimize for Victory). In general, I am constantly thinking about how to “optimize” myself — how to improve by employing an engineering mindset. So it’s important to keep in mind that many of us have little habits that can slow us down or inhibit us– but if we can acknowledge them and make a plan to overcome them, then we can work towards optimizing ourselves.